In this one-hour web session, we discuss the impact of Capital Gains Taxes, the Health Care Tax - Net Investment Income Tax (NIIT), and how to use TheAnalyst® PRO to instantly calculate how much you can defer through a 1031 exchange. Facilitated by Todd A. Kuhlmann, CCIM, with special guest speaker Scott R. Saunders, Senior VP of Asset Preservation, Inc. Scott has 27+ years of experience with 1031 exchanges and has been quoted in the Wall Street Journal. His company has facilitated over 150,000 exchanges. 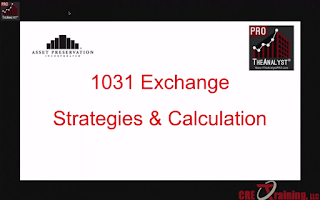 Watch "1031 Exchange - Strategies & Calculation," the 5th webinar in our series of live training sessions discussing current industry trends and ways you can use TheAnalyst® PRO to make analysis simple.